Recently sold paintings etchings prints between March 2012 & May 2013. 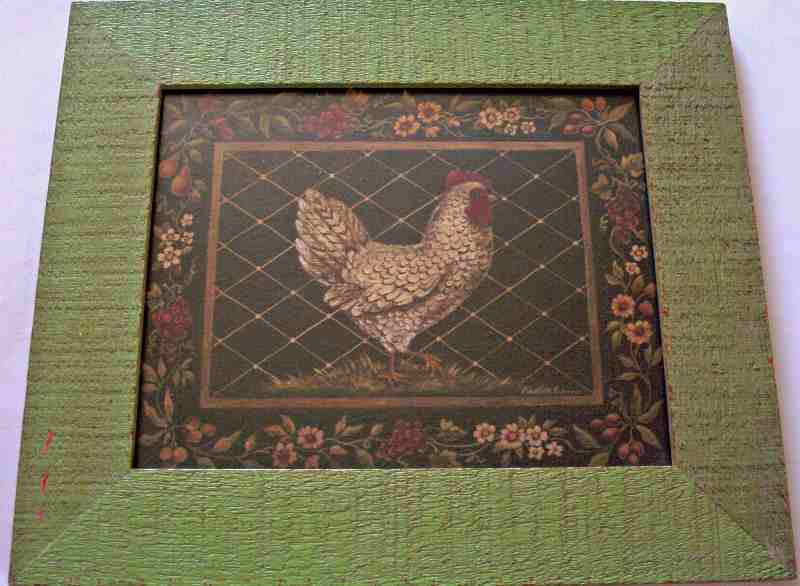 Old World Hen, print of original painting by Kimberly Poloson, c1980's. 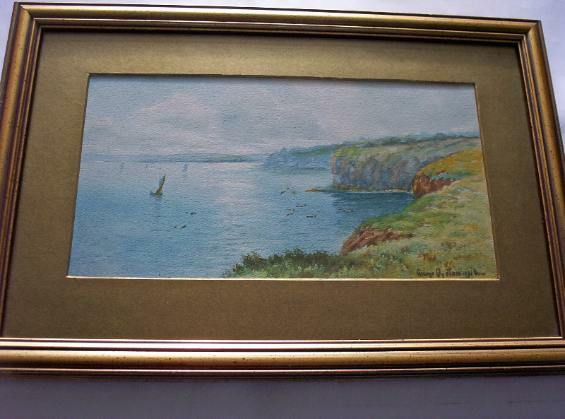 Coastal scene with boats, watercolour signed by George Oyston dated 1916. Glowed with tints of Evening Hours by Joseph Farquharson. An Open Edition print. The Chateau, watercolour on paper, unsigned, c1900. Portrait study of a seated lady, oil on canvas, signed dated Oct 1861. SOLD 11.07.2012. Fishing the river-bank, watercolour, pen and ink, signed M.G. Longmire c1900. Indian hunting scene, gouache on card. 20th Century Indian School. SOLD 22.07.2012. 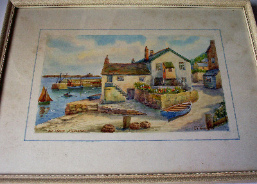 Old Wharf Mousehole by Thomas Henry Victor, watercolour on paper, c1930. Bridge over the Bosphorus with Ortakoy Mosque in background and woman begging, watercolour on paper, signed Hal Hurst, c1900. The End of an Era, H.M.S. London leaving The Grand Harbour Valletta, 1st April 1979, watercolour on paper, signed by Edwin Galea, Malta, 1979. Stormy afternoon, oil on canvas, signed A. Aslett, 1909. 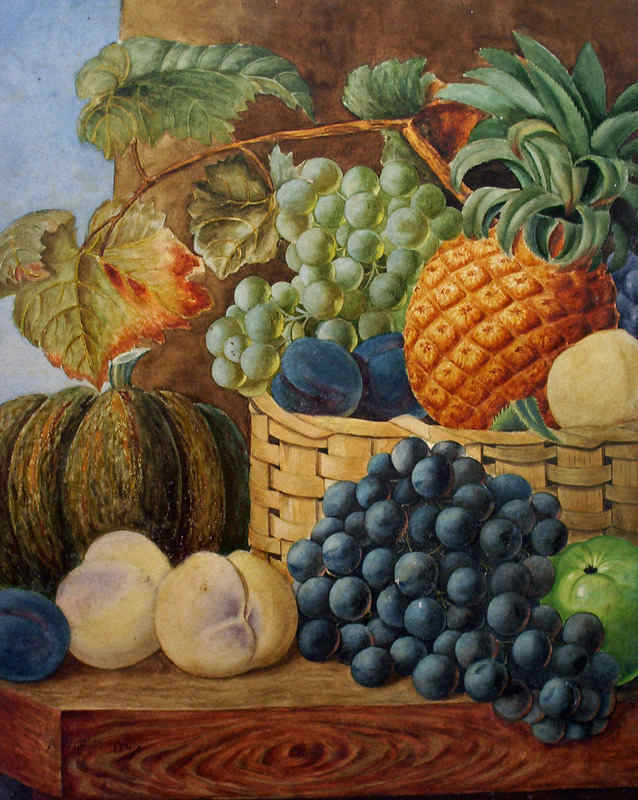 Still-life study of stein, poulet roti and dried flowers, oil on board, c1980. Unsigned. Man on camel in Egyptian desert, gouache on paper, signed Felix More', c1930. The Gipsies by George Warwick Smith of Derby, watercolour on paper, c1810. Maltese fishing boat G.4 by day and night signed D'Esposito c1900. Folkestone Promenade, watercolour and gouache, signed John V. Emms, c1960. Shaldon, watercolour on paper, signed G.M. Avondale, c1910. Teignmouth, watercolour and gouache on paper, signed G.M. Avondale, c1910. Blae Tarn and Langdale Pikes, Lake District, original etching, framed, signed C. Dickens, c1890. Mountainous lake scene with boats, figures and chateau, watercolour, unsigned. Attributed to W.L. Leitch. c1860. Whitby, East Cliff, oil on canvas, signed A.F. Watson, c1960. St. Mary's Hall Coventry, A Winter Town Scene, watercolour on paper, signed by Herbert Edward Cox, 1918. HMS Barham entering Valletta Harbour 1937, signed J. Adcock, 1975, oil on board. Portrait study of a Moroccan Rif Berber, signed Marin, Diego Marin Lopez, early 20th C Oriental School, watercolour. Watercolour painting of Mdina Malta, signed Joseph Galea Malta, 1973. Johanna Margareta Sang (formerly thought to be Miss Elizabeth "Aunt" Branwell), oil on canvas laid to board, unsigned. Late 19th Century English School. Casal Gharghur, watercolour on paper, signed Joseph Galea, Malta, 1970. The Grand Harbour, Valletta, Malta, watercolour on paper, signed Joseph Galea, 1977. Extensive coastal scene. Pen, ink and watercolour, signed Sir Henry Rushbury. c1920. A rainy street scene in Abbeville, watercolour on card, signed by Henry Woods, c1890. Continental Street Scene, oil on board, signed Grivelero Gomez, c1990. Sunset in Lincolnshire, watercolour on paper, signed V.E. Tuff, 1989. An Untitled Abstract Work, watercolour on paper, signed L. Roberts, c1980. Chinese mother and baby study, oil on canvas, signed Lee. c1950. Arabian Street Scene with woman, gouache on paper, signed A.W. Daniels, 1924. Drawing of an Army Officer, unidentified and unsigned. c1890. Coast Scene with Figures signed W. L. Leitch 1882. Watercolour on paper. The Grand Harbour Valletta, watercolour on paper, signed Joseph Galea, Malta, 1957. Mdina - The Old City, watercolour on paper, signed Joseph Galea. 1968. The Bearer, 19th Century Anglo-Indian School, watercolour, signed Sylvia Gauntlett, c1890. The Grand Harbour, watercolour on paper, signed Joseph Galea, Malta, 1969. RMS Orinoco awaiting approaching pilot vessel, watercolour on paper, signed A.E. Morris, c1900. Arabian Portrait Study, watercolour on card, unsigned. c1900. Italian Coastal Scene, Bay of Naples, gouache on card, signed H. Fusci. c1900. Interesting provenance verso, Calcutta 1929. Neapolitan Street Scene with Figures, watercolour and gouache, signed Y. Gianni. c1900. Neapolitan Street Scene with figures and flower seller, watercolour and gouache, signed G. Rovini. The Pool of London with Tower Bridge in the background, watercolour on paper, signed KEH (K.E. Howarth), c1899.